Pillings Lock is in the Parish of Quorn, to the north-east of the village itself, and is where the Grand Union Canal joins the River Soar. This waterway was originally part of the Loughborough to Leicester section of the Leicester Navigation, which was authorised by an act of 1791 and was fully opened in 1794 and included Pillings Lock. The Leicester Navigation was bought by the Grand Union in 1932, hence our waterway became what we know today as the Grand Union Canal. The earliest reference we can find to the lock actually being called ‘Pillings Lock’ is in a newspaper report on 29th March 1834, which states that on 27th March 1834, “the body of a little girl was taken out of ‘Pilling’s lock’, and was lying dead in Quorndon Church”. The 1841 census shows William Pillings (aged about 58) living in the lock house with his 62 year old wife Mary Pillings (nee Graves). They had married in Quorn in October 1815 and had only one child, Thomas, born in 1816. When Thomas Pillings was baptised in Quorn Church in August 1816, the family abode was stated as ‘Flood Lock’. Mary died early in 1861, but William appears on the 1861 census, aged 78, still working and still living in the Lock House. William died later that year in November 1861, when it was reported in the newspaper that he had been found dead in a ditch. It is little wonder that the name ‘Pillings Lock’ became firmly established – it had been the home of the Pillings for at least 45 years. Thomas Pillings did not follow in his father’s footsteps. He worked in Loughborough and eventually emigrated to America. The article below was written in the 1997s by Tom Rennocks from Barrow, recalling how he and his friends used to play around Pillings Lock and the weir as children in the 1930s. It is interesting to note that he refers to it as ‘Pines Lock’. This would be after Fred and Mary Pine who lived in the Lock House in the 1920s and 1930s. The lock house was demolished many years ago. When I was growing up in Barrow, the river contained about five spots where swimming took place. Jeals Banks was the turn of the river close to River View on Sileby Road where a solitary wooden bungalow stood. A few hundred yards upstream was Brum’s Island. The weirs were probably the most popular and the Brinks near One Man Bridge was also a well used spot, as was Briggs on the other side of the Greens where a tented campsite used by Loughborough men and students. 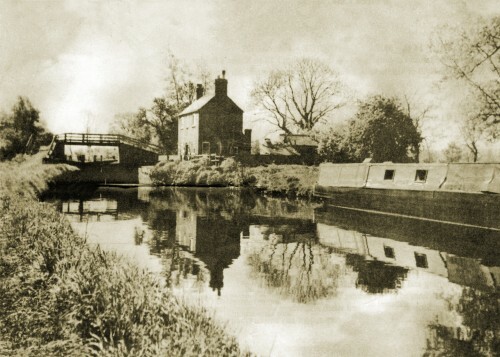 The remaining one was Pine’s Lock named after the family living there (now Pillings Lock). Like many others my first swimming strokes took place at the Brinks. It was an ideal place for small children who could paddle more than halfway across where the river deepened into a channel about two and a half feet deep. Well before I reached my teenage years and due to the swimming tuition I received from some of the student swimmers at the Greens Lido, I was able to swim front crawl quite well. At the time the Tarzan films began appearing at local cinemas. Needless to say, my hero was Johnny Weissmuller who in the 1924 Olympics had won the freestyle event with his new American crawl. Packing up some food, lemonade, swimming and fishing gear was all that one would need for a great day out at the weirs or at Pine’s Lock. Recalling some of the happenings which took place during these days, one thinks of Len Hands who probably spent more time in the water than anyone. In full view Len would dive in from the Driver’s field bank – a small built lad but with a remarkable capacity for holding his breath – he would surface amongst a crowd of swimmers on the other side unnoticed while the cry of “Where is he?” would be heard. One day Len was asked to accompany a grown up on a swim to Mountsorrel and no doubt they would have made it, had a pair of hostile swans not attacked them near Brum’s Island. Missing information: Can anyone date this photograph or supply any more information/pictures about/of the lock area?